Why would an American need to claim refugee status in Canada? Sounds crazy? Bethany Smith was 18 and unemployed when she joined the US military. She is also a lesbian. While working as a mechanic for the military, she was harassed and insulted because she looked like a lesbian. When Bethany was seen holding hands with another woman in a mall by her colleagues, she started receiving harsh treatment and assignments from her superiors. She was physically abused and she also received over 100 anonymous notes on her dormitory door telling her a range of things: ordering her to stay in the closet, threatening to beat her and warning that she would be killed in her sleep. Bethany was stationed at Fort Campbell, Kentucky, a base where Private Barry Winchell was beaten to death in his sleep for allegedly being gay. Bethany did not know whom she could trust and thought that any of her superiors could be behind the threats. Because she feared for her life, she started openly expressing herself as a lesbian and tried to obtain a discharge from the military under the Don’t Ask, Don’t Tell (DADT) policy. Her requests were met with laughs and denials. Her superior told her that her request would be attended to after deployment to Afghanistan. Bethany’s request came at the height of the War on Terror and presumably every body in the war was important. She could not fathom the possibility of having her back watched in a war zone by those who wanted to see her dead. In Canada, a person can claim refugee status if one fears persecution in your home country and the state is unwilling or unable to protect you. Bethany presented her story to the Immigration and Refugee Board in the fall of 2008 and was denied refugee status in February 2009. This decision was judicially reviewed at the Federal Court in September 2009. 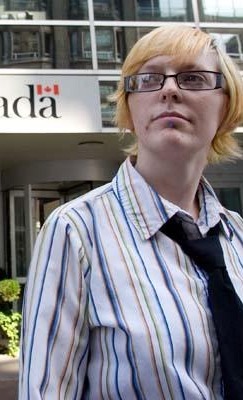 In November 2009, the Federal Court agreed with Bethany that the decision was unreasonable because the Board did not take into account the context that Bethany found herself in. The remedy was to present her story to another Board Member which was done in August and October 2010. Since then, the representative for the Minister of Citizenship and Immigration has submitted to the Board that because of recent efforts to repeal DADT, Bethany has nothing to fear. Professors Katherine Franke and Suzanne Goldberg provided letters of support in response to the Minister’s argument that the recent political events regarding DADT reflect the fact that the US is willing and able to protect people like Bethany. They provide their opinion that the frequency of homophobic and gender-based violence against women and men in the armed services has not decreased, and that the military is not responsive to complaints of violence related to gender or sexual orientation. The fact that the Obama Administration is continuing to defend legal challenges against DADT also reflects the lack of protection the state is providing to gay and lesbian members of the US military. As well, the Congressional repeal of DADT has not been implemented. It is uncertain what the form or the substance of the repeal will look like if it is ever implemented. In sum, the state is still engaging in extremely restrictive and punitive rules governing lesbians, gay men and bisexuals serving in the military. Bethany’s story is a perfect reflection of this. While Bethany has sought sanctuary in Canada, her family has been visited by military police looking for her to prosecute her for military charges of absence without leave and desertion. Should Bethany return, she would face being put back in her unit and being deployed, court-martialed or detained in a military prison. Any of these possibilities could threaten Bethany’s life or amount to Bethany being punished for simply being gay. She would be punished because the US failed to protect her against those threatening her simply because she is a lesbian and because she took matters into her own hands to save her life. If a refugee is someone who has to leave her country because she had no choice in order to preserve her life, then it is possible to imagine that an American needs asylum in Canada. Jamie Liew is Bethany Smith’s lawyer and an LL.M. Candidate at Columbia Law School.